​At a young age, Courtney Gifford was diagnosed with ADHD, Attention Deficit Hyperactivity Disorder. 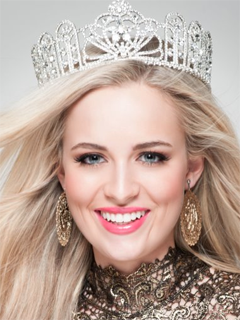 Courtney started pageants during her high school career as a way to overcome and spread awareness for her disorder. She has traveled all over the country, speaking to anyone that she could about this disorder. She has even been featured in a nationally distributed magazine about people with ADHD. Her travels have taken her all the way to lobbying on Capitol Hill, but Courtney says that the most rewarding part of her philanthropic work is being a positive role model to kids with ADHD. With a learning disorder like ADHD, she defied all odds when she graduated with a 4.0 GPA from her junior college. Following this, she went on to join many honors groups at the University of Wyoming during her undergraduate work. During this time, she received many awards for her work in the communications department. Currently, Courtney is in her final semester of her Masters in Communications degree at the University of Wyoming. Following her graduation, she plans to pursue a career in sports communications for either an NFL or division one College football team.